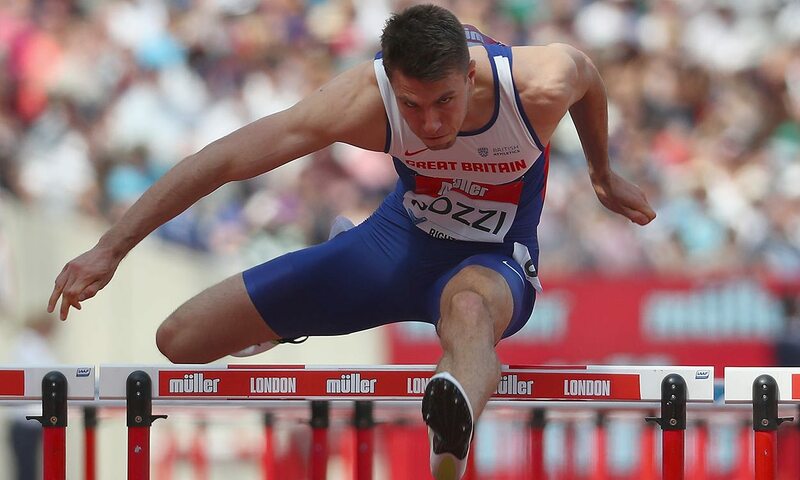 Andrew Pozzi says breaking Colin Jackson’s British and European 110m hurdles record is “without doubt” something he would like to achieve but, right now, his mind is on medals rather than record marks. After a tough few years of injury struggles, Pozzi proved his fine form by being the world No.1 during the indoor season and has already equalled his outdoor PB of 13.19 this summer. Speaking with AW recently, Jackson insisted Pozzi is more than capable of beating his record of 12.91 and that belief gives the 25-year-old confidence, especially ahead of the IAAF World Championships in London in August. “Colin’s British and European record was the world record for over a decade, it’s an incredibly quick time, and if I’m able to run quicker than that in London then it’s going to be tough for anyone else looking to compete with that,” said the European 60m hurdles champion. “But that’s not my main aim at the moment. Looking ahead to London, Pozzi, who will first compete back in the UK capital at next month’s Müller Anniversary Games, added: “There’s no point rushing ahead to the final before I make it but I think on the basis of my times and how I’ve run those times we’ve got to be looking at realistically pushing for a medal. I think that’s what it’s all about. While Pozzi has an eye on a first global medal in London this summer, he recently experienced another, not so welcome, first with a false start in Stockholm on Sunday and Jackson was on the phone to offer advice. “Having Colin’s help has been invaluable,” said Pozzi, who explained how he had been left “so frustrated” in Sweden as he missed the opportunity to take on another top field. “I’ve never false started ever in my career, I’ve never even really false started in training or anything like that,” he said. “I didn’t think I had false started in all honesty. However, obviously the results showed that wasn’t the case. It was frustrating because what I am missing at the moment is the race experience, so that was certainly an opportunity missed. “I walked back to the warm-up track very angry and annoyed at myself. Then my coach and I decided to put the hurdles up at the warm-up track and make the most of being there. “We actually had a really productive session. I stayed for about an hour after the stadium had closed and everyone had gone to put some work in and keep in perspective that, whilst it wasn’t ideal preparation, that’s never been my goal or my aim for the season.